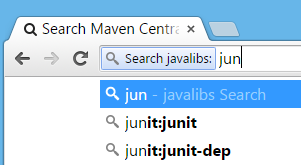 Out-of-the-box search box tries to be intelligent and look for everything based on the input query, but you can also narrow down search to search for dependencies, Maven plugins, archetypes, BOMs and even Java classes. Note: You can change the keyword which activates this search. Right click inside the omnibox, select Edit search engines and change javalibs.com to anything you like (I change it to "m"). Every artifact has Maven / Ivy / Gradle / Scala / Groovy / Leiningen dependency string. Also you can download the artifact itself (usually a JAR file), see sources, javadoc and pom.xml. 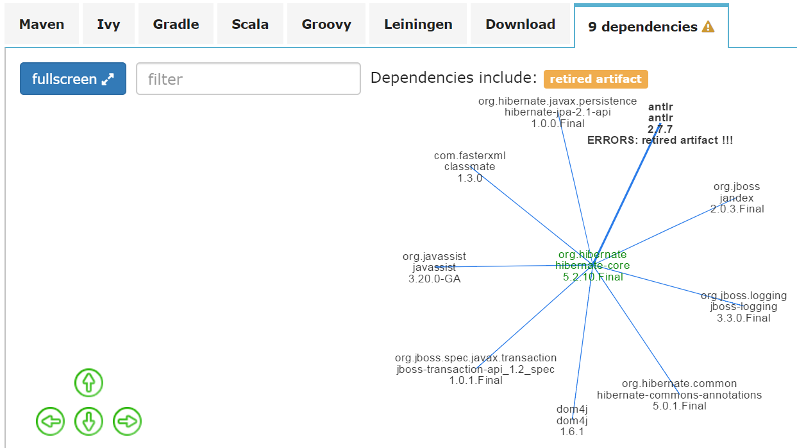 And also you can view dependency tree. 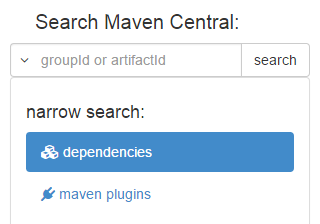 Every artifact has "Artifact usage" chart, which displays how much is selected artifact used as a dependency in other Maven artifacts in indexed Maven repositories (Central, JBoss, Spring, ...) and public GitHub projects. 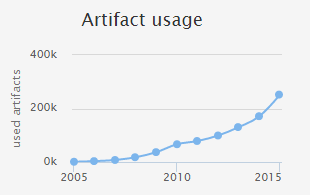 It shows number of new projects using selected artifact every year. Most artifacts are in Maven Central, but several large companies don't publish their artifacts to Central for various reasons. There are many supported repositories and whenever you see the repository badge, click it and see instructions how to use it. Every artifact has a JAVADOC panel where's Javadoc (obviously) :-) It's currently a work-in-progress, basic Javadoc functionality has been achieved and now I'm enhancing it because Javadoc could be much, much better than current industry's standard.